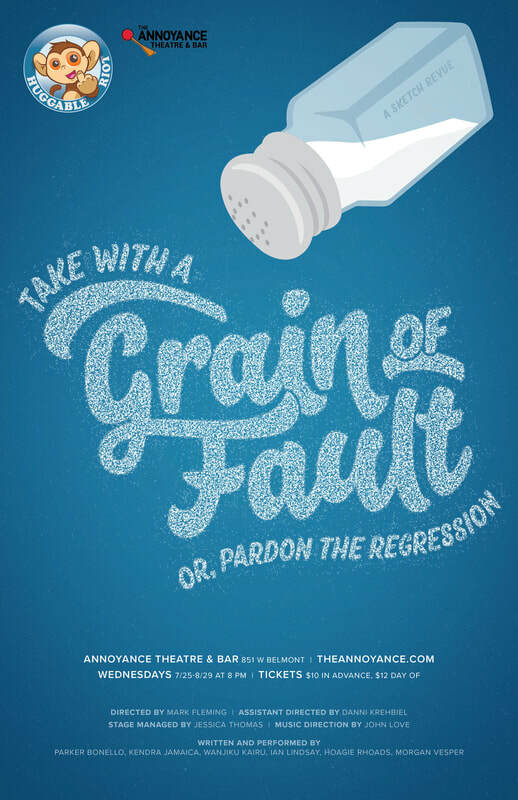 The never-ending finger pointing between Millennials and Boomers over who is good and who is bad will be put on blast when Huggable Riot opens its next revue, Take with a Grain of Fault (or, Pardon the Regression), at The Annoyance Theater and Bar on Wednesday, July 25. Huggable Riot’s 19th production, Take with a Grain of Fault explores relationships between the past and present, where we are headed, and what it all means in the end; and the result is a collective, "We don't know, but had fun getting there." Whether through philosophical window washers, the world's worst therapist, or the child-like wonder of the Cult of Cthulu, this revue cares most about the journey and the friends made along the way. Take with a Grain of Fault concludes Huggable Riot’s fourth annual Summer of Sketch - which saw the company produce original material all season long. This show is directed by Huggable veteran Mark Fleming and assistant directed by Danni Krehbiel with musical direction by John Love and stage managed by Jessica Thomas. A mix of new and veteran Rioters wrote and perform the revue including Parker Bonello, Kendra Jamaica, Wanjiku Kairu, Ian Lindsay, Hoagie Rhoads, and Morgan Vesper.